Colorado pilot, Penny Hamilton, accepts the ABC-Denver 7 Everyday Hero Award from Channel 7 broadcast anchor, Mitch Jelniker, for her 20+ years of community service especially her “Penny the Pilot” aviation education programs. Recently Colorado General Aviation pilot, Penny Hamilton of Granby, was awarded the Denver, Colorado ABC Television award for outstanding volunteers, 7 Everyday Hero, during her Granby Library Pre-school Aviation Education program called “Penny The Pilot,” where she is dressed as historic aviator Amelia Earhart. The 7 Everyday Hero award is presented to Colorado volunteers who motivate others, make a difference, and donate their time and talent to build a better community, often over an extended number of years. Penny has a long history of community involvement spanning over 20 years in her Greater Granby area of Colorado. 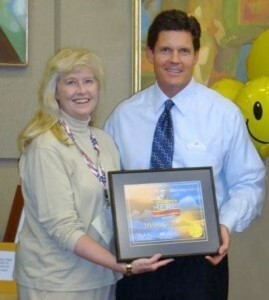 In 2005, she was recognized as Grand County Realtor of the Year for her public service and charitable work. Hamilton is an active member of the Colorado Pilots Association, Colorado Aviation Historical Society, Wings Over the Rockies, 99s, Founding member and current volunteer Secretary of the Friends of Granby Airport, AOPA ASNV for Granby/Grand County Airport and past winner of the FAA Central Region Administrator’s Champion award for her work on behalf of aviation education. In 1994 the FAA named a new holding intersection just south of the Granby airport at an altitude of 15,500 feet above sea level for her. Because “penny” was already in use in another part of the airway system, the FAA computer found “Peney” available and is now shown on current aeronautical charts.